There’s something entrancing about the pixel. Square and elegant and when pushed by the right people they can form beautiful art, stunning animations and gorgeously crisp text. But as resolution and pixel density increase these building blocks of the screen become smaller and individually insignificant especially as the dpi of displays hits 220+ppi. What once was a building block of art and design becomes nothing more than a indistinct element in a photo-realistic image or a glint in a faux-texture supporting a skeuomorphism. 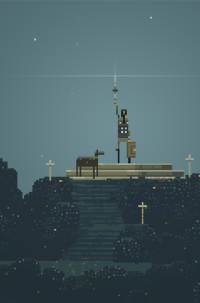 And so the art style of the visible pixel is doomed… or is it? A resurgence in retro games over the last 10 years has helped keep pixels front-and-center (and sometimes off-screen to the right in the case of horizontal scrolling beat-em-ups). Minecraft brought 3D pixel art to the mainstream with its wild success across PCs, iOS and even the Xbox. Some people say it’s despite the graphics but I think they’re part of the charm. Skrillex Quest is a 3D Flash game with textures made up of large pixels and all manner of 8 and 16-bit style graphic corruption that lends to the retro feel while music from the man himself ensures your ears stays as overwhelmed as your eyes. Sword & Sorcery: EP is a recent discovery for me but its gorgeous 2D landscape, fun story and great sound make for awesome atmosphere. It’s currently available on Steam for the PC or Mac and available from the iOS store too. LucasArts Adventure Pack on Steam gives you a bunch of point and click adventures including two installments of Indy, Loom and The Dig. They also have a Secret of Monkey Island 1 & 2 Bundle that has updated graphics but your can toggle back to the pixelated 256-color VGA version at any time. Scott Pilgrim The Game is a fun little horizontal-scrolling beat-up up created a couple of years back. Some of the graphic artists have some great pages up showcasing their pixel animating talents. Home from Benjamin Rivers is a creepy whodunit horror mystery where the story unfolds and changes based on your own actions. Who knew pixels could be so creepy. eBoy is a three-man team that has been creating isometric pixel art for years sometimes for magazines and adverts but primarily available as posters and wallpapers and now puzzles too. 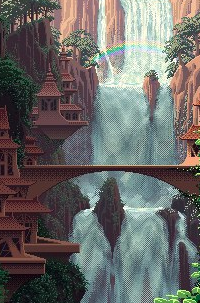 Color Cycling revisits the technique of animating hand-illustrated Amiga artwork that achieved the effect of animation simply by cycling parts of the color palette. This effective technique was incredibly space efficient and was something every Deluxe Paint user tried (and likely failed) at some point. Iotacons by Andy Rash are very low-resolution icons of various celebrities and well known pop-culture figures lovingly adorned in digital format and, on occasion, as a real-world cross-stitch. DeviantArt have an entire category dedicated to pixel art many of which are lovingly animated. If the cuteness of these pixels doesn’t make you miss them then nothing will. F David Thorpe produced some great loading screens for computers in the 80s despite their crazy technical limitations. Binary Zone has a great page that highlights some of his best. Animated backgrounds from various fighting games look beautiful. Semplice Pixelfonts has some beautiful proportional pixel fonts in TrueType format. Guidebook has screenshots of various pixelated desktops throughout the years including shots of early Macintosh, Amiga, Atari, OS/2 and more. ThinkGeek have the I See Dead Pixels T-Shirt, the 8-bit tie and the less practical 8-bit hair bow. 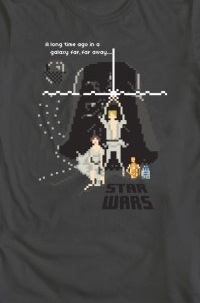 WeLoveFine also have a great selection of 8-bit wears just flowing over with pixels. Red Bubble have a Mac Cursor Icons T-shirt that the original Apple fans can appreciate. Even sunglasses get the pixel treatment in black or blue… or even regular clear glasses. Cube Craft Pixel Pages consists of a bunch of icons you can print out, cut and fold to create a pixel-deep real-world rendering when placed against a solid surface. My Desk is 8-bit happened when Alex Varanese wondered what a video-game would look like rendered on his desk. It’s a labor of love 1:18 long video with great chip music too. Swedish Subway shows that the small square tiles that adorn the walls of subways can be put to creative use when you think of them as pixels such as this homage to video-games. Playing Cards featuring pixel art including some from video games such as space invaders. 8-bit pop-up cards are a fun way to make a gift card with more pixel goodness. A love of pixels can however go too far. Wikipedia has an excellent article on the screen resolutions and color capabilities of 8-bit and 16-bit computers. With such few colors available it was necessary to blend colors together to achieve the effect of more colors or shades. This tutorial at Deviantart is a good start although there are a few different algorithms available including the most famous Floyd-Steinberg and the ordered dithering of Windows older users may be familiar with. Derek Yu, Pixel Schlet and Garmahis provide tutorials showing you how to do it by hand! Teletext (aka Videotex, Ceefax) was a low-resolution graphics system long before the Internet. It was available in some countries such as the UK via television and some early computer systems (Prestel, Micronet) used it over incredibly slow (1200/75bps) modems although it had a certain charm. Of course for the ultimate pixels experience you could also just dive back in to the old games such as those provided by Good Old Games (PC) on the amazing World of Spectrum.